Consumers want knives with the perfect surface finish. They don’t want to see tool paths or marks on knife handles and frames. That’s why Zodiac Engineering, a knife manufacturer in Los Angeles, uses dot-style NamPower disc brushes. These metalworking tools are designed for light-to-medium duty deburring. They conform closely to part contours and provide metal cleaning and polishing, too. Another Los Angeles knife maker, Balzano Knives, also uses NamPower discs to remove burrs and improve surface finish. To achieve clean, straight lines and a distinctive look-and-feel, Paulo Balzano needed a high-quality metalworking tool. 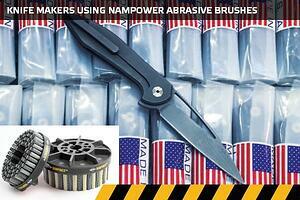 As this video explains, dot-style NamPower disc brushes are now the toolmaker’s tool. Sea Ray, the world’s largest manufacturer of superior-quality pleasure boats, knows that luxury yachts need a smooth, attractive finish. So when the boat manufacturer wanted a better way to sand hulls made of composite materials, BRM floated the ideal solution. NamPower disc brushes in a robotic arm are faster than manual sanding. These brushing tools also ensure consistent quality, even when fiberglass surfaces have variations. 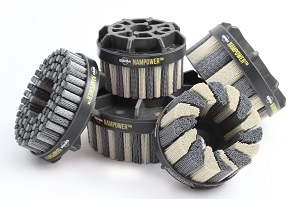 For heavier-duty applications, turbine-style NamPower disc brushes get the job done. Orange Vise makes CNC machine vises and quick-change fixturing components. Before discovering NamPower discs, the California machine shop removed burrs from milled parts by hand. Today, the Union City company uses NamPower technology with its automated equipment. With NamPower disc brushes, Orange Vise achieves maximum burr removal rates and an optimum surface finish at the same time. The vise manufacturer has also automated the finishing of chamfered edges. Learn More. Get the Guide. Would you like to learn more about NamPower technology for parts deburring, edge radiusing, and surface finishing? The NamPower Resource Guide is the ultimate source of information about NamPower tools and how to use them. Get your copy today.